No matter what Gov. 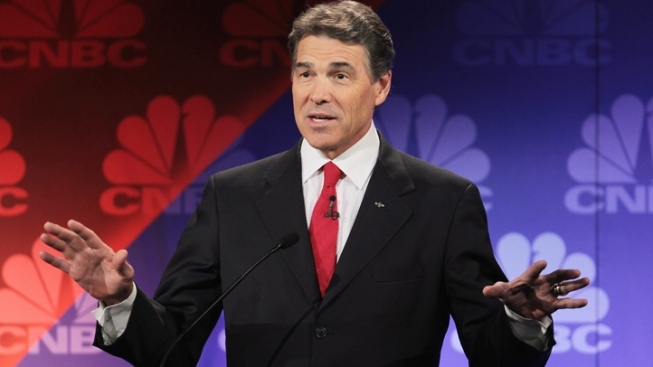 Rick Perry announces on Monday, his decision will transform politics in Texas. If the state's longest-serving governor chooses to retire, then at least six out of nine elected executive offices will change hands in a series of political dominoes. Texans will replace the governor, attorney general, comptroller and commissioners for land, agriculture and railroads. They'll also get a chance to choose another lieutenant governor, with three men running to replace David Dewhurst. If Perry chooses to run again, the top Republican politicians in the state will have to do some soul-searching. Many of the candidates have waited years for a chance to move up, and if Perry seeks re-election, they'll have to decide whether their personal aspirations should take a back seat to party unity. The governor has twice delayed letting the world know his plans due to two special legislative sessions. A scheduled announcement Monday in San Antonio will likely at long-last provide clarity. No one on Perry's official or political staff will discuss his plans and those closest to him say he could change his mind at the last minute. But his decision will echo across the state, triggering campaign machinery for at least a dozen candidates. First among them is Perry's heir-apparent, Attorney General Greg Abbott. He has more than $18 million to spend and has built the infrastructure and reputation necessary to run for governor. Since he and Perry share the same campaign consultant, most observers assume Perry will not run again and clear the way for Abbott. Barry Smitherman, whom Perry appointed to the Railroad Commission, has already announced he will run for attorney general -- if Abbott seeks higher office. Smitherman's close ties to Perry and his odd provisional candidacy suggest he might have received a hint that the attorney general post will be open. Smitherman would run in the Republican primary against Dallas Rep. Dan Branch, who also announced a provisional campaign. The fiercest battle among Republicans, though, will be for lieutenant governor. The race is already crowded with Land Commissioner Jerry Patterson, Agriculture Commissioner Todd Staples and Houston Sen. Dan Patrick giving up those elected seats to oust Dewhurst. But if Perry runs again, many speculate Abbott could use his war chest to jump into that race, too. Lastly, Susan Combs said earlier this year that she will not seek re-election as state comptroller, and Republicans further down the chain are lining up to replace her as well. All of this positioning certainly helped inform Perry's decision on whether to seek an unprecedented fourth full-term as governor. But he's also held the office since December 2000, when George W. Bush won election to the presidency, and Perry has aspirations of his own. He has not ruled out another run for president in 2016 and frequently recites the lessons he took from 2012: lay the national groundwork for a campaign in advance, get into the race early and don't undergo back surgery just weeks before getting started. Perry has promised to let supporters know his presidential plans before the end of the year, three months prior to the Republican primaries on March 4, 2014. That means if he does intend to run for governor in 2014 and president in 2016, he'd be making the announcement before he'd won the 2014 Republican gubernatorial primary. Since campaigning for both governor and president would risk losing both races at once, his timeline for decisions suggests he won't run for governor and another presidential bid is in the cards. If Perry should be taken at his word, then the "exciting news" his office announced for Monday will be a plan to boost his role as a national Christian conservative leader. An early entry into presidential politics could follow later this year. The national media attention on Texas' proposed new restrictions on abortion plays perfectly into this plan. Every report about Democratic state Sen. Wendy Davis and her filibuster against the law reminds social conservatives that Perry has called two special legislative sessions to pass the law. That spotlight also transforms Texas politics by mobilizing national Democrats to fight for control of the country's second most-populous state. Texas Democrats are waiting to see if Davis runs for governor and see in her the best chance of winning statewide office in 20 years. Party Chairman Gilberto Hinojosa said he thinks her odds are better if she runs against Perry. That leaves little doubt that when Perry takes the stage on Monday, he'll be in a politician's favorite place on earth -- the center of attention.